Astor Place Cube Protest-Chalked. We Like It Better As a Rubik’s Cube. Dear Cube, you were kind of funny this way. 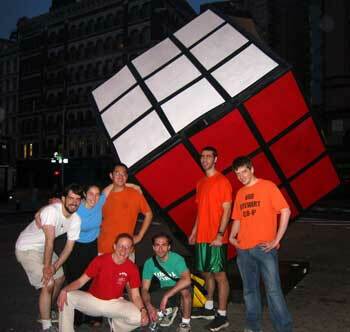 More photos from All Too Flat’s Rubik’s Cube prank here. Over the years, the Astor Cube (a/k/a Tony Rosenthal’s Alamo) has vanished and reappeared. It’s been turned into an inoperable mechanical puzzle, cleaned, paid tribute, hit with LED throwies. Today it’s chalked. But we’re confused. We’re all for peace. We’re all for bringing the troops home. We’re fine with hugs and hippie smells (<–not really). But how does scrawling these messages on the Astor Place Cube help actualize these ideas? Especially when within five hours, a directive like START THINKING has been rechristened ART KING and FAIR TRADE reads AIR RADE. Also confusing? How shouting out your friend Dee and wondering if your canvas spins helps this message of peace. (Yes, the Cube spins.) Please explain. What won’t you stop? Repping Brooklyn?